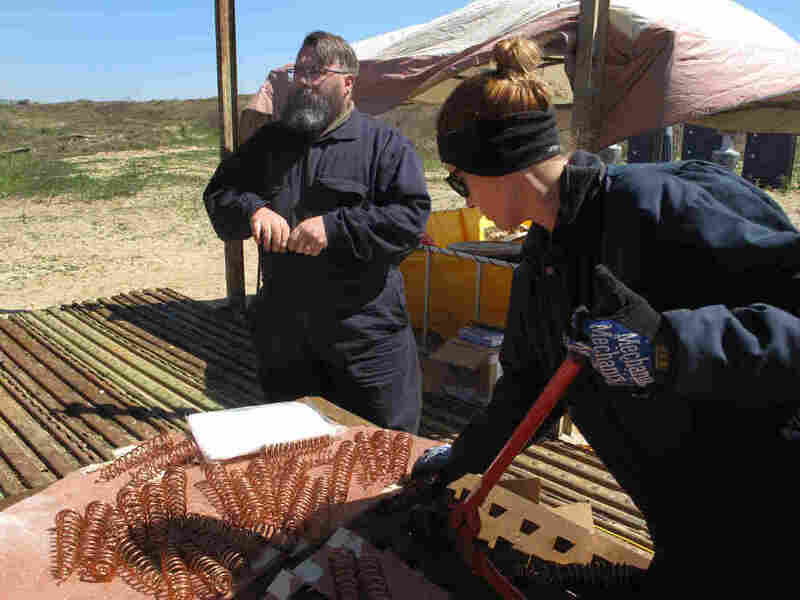 Researchers at the Coast Guard's Joint Maritime Test Facility on Little Sand Island, in Mobile Bay off the Alabama coast, fit the Flame Refluxer with coils for a test burn. "The coils collect the heat from the flame and they transmit it through the copper blanket," Rangwala explains. The goal is to make a hotter, faster and more complete burn that leaves less pollution. Cleaning oil from water is a challenge, especially on the open sea. That was dramatically evident seven years ago, when a massive oil spill during the BP disaster polluted the Gulf of Mexico. The Flame Refluxer after a test burn. 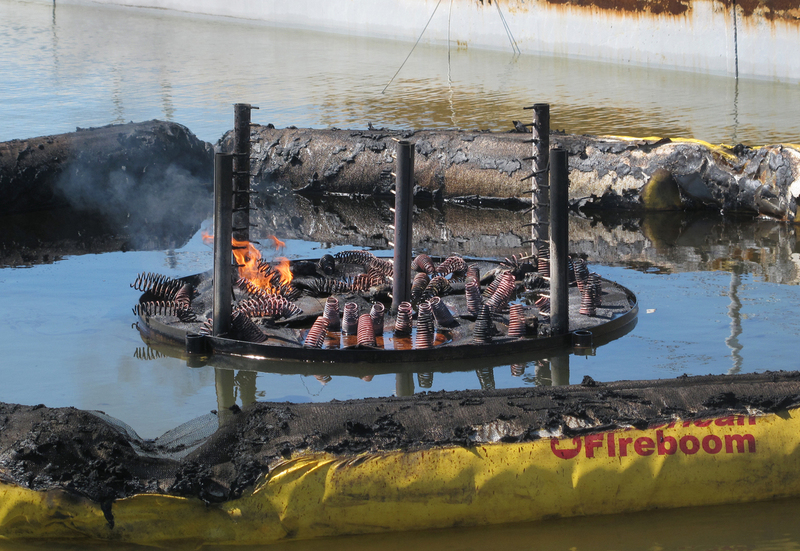 Responders typically use three cleanup methods in an oil spill: skimmers and oil booms to soak it up, dispersants to break it up, and fire to burn it up. That's called in-situ, or in-place, burning. The federal government is backing research on the Flame Refluxer, which supporters hope will provide an effective and ecologically sound alternative. 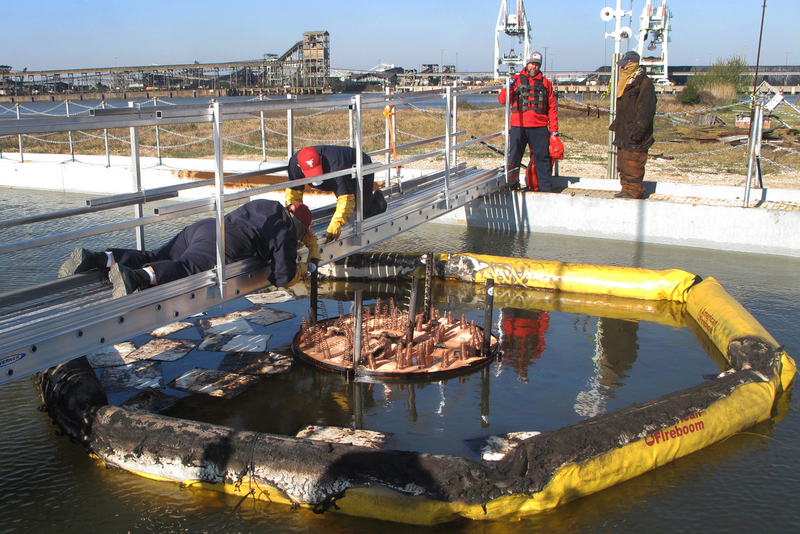 For the test — at the U.S. Coast Guard's Joint Maritime Test Facility on Little Sand Island in Mobile Bay — workers place the blanket inside a ring-shaped floating protective barrier, or fire boom, in a concrete pool. Oil is pumped from a nearby tank, and a long torch-like lighter sets it afire. Before long, the fire is roaring with flames up to 12 feet high. Rangwala monitors by video in a nearby research shed. "It's looking very good," he observes. Engineers are tracking the fire's heat and the emissions that are being captured by a strategically placed windsock downwind of the test burn. The device potentially could reduce air pollution, as well as the layer of tar that remains after oil burns and sinks to the ocean floor, threatening marine life. Rangwala says the copper blanket was designed to capture any remaining residue, but they're finding that the tar is burning off as well. He says the test indicates a hotter, quicker, cleaner burn. "Currently it's about three times faster than baseline," he says. "And the smoke is also grayish in color, compared to black." The gray smoke, with less soot, is one of the things that Karen Stone is looking for. 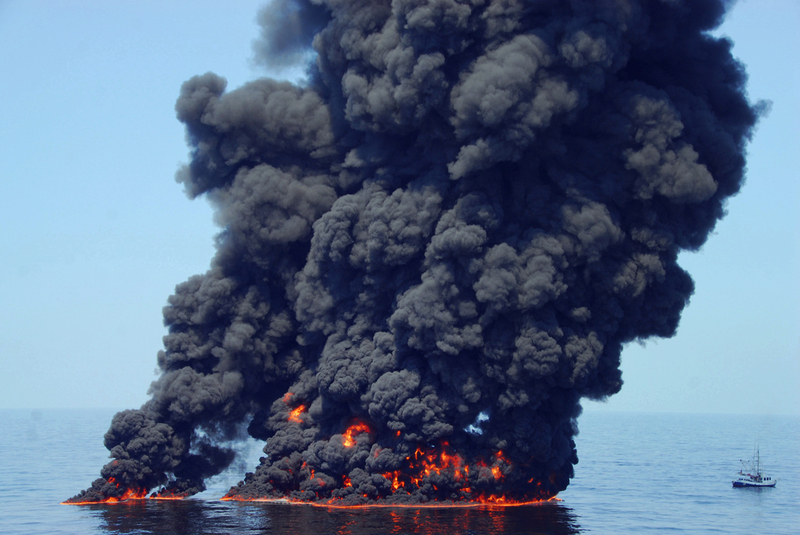 "The lighter it is, the cleaner it is," says Stone, an oil spill response engineer with the federal Bureau of Safety and Environmental Enforcement. Workers at the Coast Guard's Joint Maritime Test Facility fit the Flame Refluxer with coils for a test burn. The agency has invested $1.5 million to develop the Flame Refluxer, and is also paying for other new technology. It's an effort to be better prepared to respond, after the 2010 BP disaster in the Gulf revealed some major gaps. For example, the country didn't have enough fire boom on hand and had to scramble to borrow supply from other countries. Black smoke billows from a controlled burn of surface oil during the 2010 Deepwater Horizon oil spill. "Once you have a spill, it really gets the attention," says Stone. "We realize, wow, we really need to advance it and make it better, improve it, for when it happens again." Stone says the technology that is working in the Gulf environment also shows promise for responding to oil spills in the Arctic. But it is likely 5 to 10 years from being used in an actual disaster. The next step is finding the best way to deploy and test it in open water.